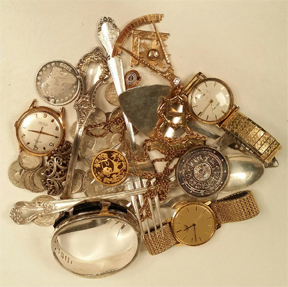 Before you have that Yard/Estate sale, donate or begin to throw items away, have our company provide you with a complimentary walk-through evaluation. All too often we have heard that a client has disposed of, donated or worse, had a person with very limited knowledge and “cherry pick” items that could have had much more significant value without providing relevant disclosure of value or resources. Our advice is that one should never offer items for sale without having such relevant information of value. This would include items such as old fountain pens, ephemera (postcards, paper, and old books), military memorabilia, pottery, porcelains, glassware, sculpture, fine art, vintage clothing / textiles, musical instruments, costume and fine jewelry, coins – stamps, old watches, various collections, antique tools, and vintage electronics. Just to name a few! Discovery of valuable items is our strength and passion. If you are settling an estate, downsizing, cleaning out a house, in need of an appraisal, selling valuables or preparing a house for sale. In most cases, items of value can be easily overlooked. In addition, it can be very time-consuming and emotionally stressful. Obtaining proper value, moving items, what and what not to keep can often require professional assistance. Our company offers many options of estate settlement and appraisal services to remove the burden, stress and provide peace of mind that nothing has been overlooked. Associated Estate & Appraisal Co., Inc. can provide you with a level of service that no other company can offer. We literally love what we do! We Buy Gold, Silver, and Coins! Check around and always ask!